Radiology is a specialty field in medicine primarily dealing with the interpretation of diagnostic films such as CT scans, MRI, x-rays, ultrasounds, sonograms and other methods of imaging. Radiologists are often called in to review these scans for injured or ill parties for diagnosis of internal injury, bleeding or fractures. According to the National Institute of Health (NIH), radiology is one of the specialties most likely to be the subject of claims of medical negligence, usually stemming from a failure by a radiologist to correctly read and interpret a radiographic. 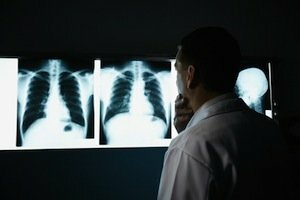 In a 2012 report, the NIH said reading errors by radiologists usually arise from poor technique, lack of knowledge and experience or failures of perception. Failure to diagnose accounts for about 40-54 percent of radiology-related medical malpractice cases, according to the NIH. Radiologic “misses” typically are one of two types: either missed fractures or missed diagnosis of cancer. The most commonly missed fractures are in the cervical spine, the femur and the navicular bone, which is a bone in the foot. The second type of “miss” is failure to diagnose cancer. Radiologists often fail to spot bone tumors, colorectal carcinoma on barium enema studies, lung nodules on chest radiographs or breast lesions on mammograms. When radiologists misread or misinterpret films, the patient can suffer severe consequences. Kreisman Law Offices has represented clients who have suffered as a result of radiology errors. With more than 40 years of trial experience in medical malpractice, the Chicago lawyers of Kreisman Law Offices have the knowledge and expertise to obtain justice for you. Over 12 percent of the 2,000 radiology errors in 2011 resulted in some degree of harm to the patient. This was seven times more harmful than medication errors. The high risk of harm can be attributed to the fact that the radiologist's review is crucial to the patient's treatment. Often the radiology diagnosis serves as the basis for the patient's treatment course. When the patient returned later with complaints of weight loss and a cough, he had a repeat chest x-ray that showed a large tumor in the same region as his prior scan. What had been diagnosed as an artifact, turned out to be cancer. The patient died six months later because the radiologist saw an abnormality on the radiograph, but rendered an incorrect diagnosis. Radiology errors can result not only from the radiologist misinterpreting a scan, but from a lack of communication between the radiologist and the other treating physicians. Take for example the case of a Chicago pregnant woman who presented to the emergency room with vaginal bleeding. She was immediately sent for an ultrasound to assess her baby's health. The test showed little to no fetal movement. But instead of instantly advising her obstetrician of this, the radiologist simply wrote the result in the chart. Because of the delay in her obstetrician getting the results, her baby was not delivered for another hour. The baby survived, but was left with permanent brain damage. If you or someone you love has suffered from a radiology error, please call us for an immediate free consultation. With more than 40 years of experience in trying and settling radiology error cases, Chicago's Kreisman Law Offices provides the best possible services to our many clients and achieves unsurpassed results. Please call us 24 hours a day at 312.346.0045 or toll free 800.583.8002 for a free and immediate consultation, or complete a contact form online.